This explodes out of a glorious cover by art droid Ryan Brown. 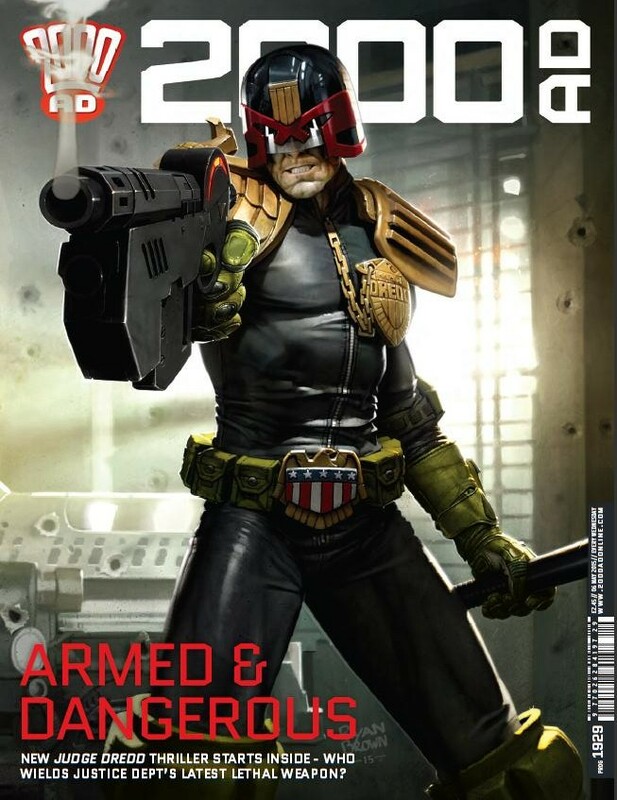 Having taken the bold – some would say risky – decision to leave the Dredd story hanging unresolved from last prog, this cover reminds us that, front and centre, 2000AD is powered by Ol’ Stoney Face. And this is “proper” 2000AD now – offset stories, some old, some new. How does it cope? As I mentioned, last issue took a real gamble by not ending. Dredd can drag if not handled well, so with Wagner at the helm we have to have the highest of hopes (no pressure, eh?) And my word, it does not disappoint. As always, it’s the social commentary that really shines. Don’t get me wrong, this delivers thrills, but in the build-up to the current election this is sharp, edgy stuff. Couple that with slick art, we get a tale of a disaffected loner that’s absolutely gripping and really kicks the prog off in style. I’ve spoken at length about the excellent antics of the Sovs’ top agent. Swinging in – and out – of the page in a serious spook-off, we get our desire for b&w retro action and wry comedy styling. Still delivering after 6 progs on the trot, the end is satisfying, if not unexpected – an 80s payoff for an 80s tale. At last – I hesitate to say at long last – Sláine starts to pick up pace again this issue. The somewhat arbitrary, you might even say random appearance of Trojan armies in last prog, actually begin to make sense here, and we have a satisfying flashback to Sláine drinking with his old comrades (great to see Ukko and Gort again, though not obstructive if you don’t know the characters), and helps us see the warlord in all his deep and brooding glory. With the continued strength in the art department, the whole piece comes together in a magnificently garish, gory finish that leaves you wanting more. Classic Mills. Abnett is clearly enjoying playing with the Prog form to give us an effectively disjointed narrative. From the tedious whimsy of the last couple of progs, he ramps up the tension in this prog in explosive fashion. The simmering prospect of apocalyptic annihilation means that the various alien races stuck facing doom are all starting to fray one another’s nerves, and our hero Adam Bullitt has taken it upon himself to get everyone the hell out of there. It’s gone from my least favourite part of each prog to my favourite new thrill, and it’s still entry-level stuff – you can pick it up right now and it’ll make perfect sense. Double Wagner? Yes thanks. Johnny Alpha, mutant bounty hunter, really gets into the whole “scum and villainy” part here, where his story takes him to an asteroid pirate base on his continued attempt to track down the notorious Stix clan. It’s effortlessly paced, grubby and wry – it’s like Dredd and Firefly had a lovely mutant baby. With Ezquerra’s art never forcing itself on you, it’s easy to forget how stylish, and stylised, it is. This is another story that, despite being a long way in is still completely accessible and really keeps you hooked. And one last thing – a splash page reminding you from good old Joe Dredd that Democracy is wrong. Don’t forget to vote, Citizen! With the prospect of more political shenanigans ahead (Clegg vs Klegg, anyone?) this is spot on. So if you just jumped back in from FCBD, looking for new thrills or lusting after old, get back in 2000AD. You’ll not be sorry, earthlet.